Time for some inspiration! I’m loving this sweet little elopement styled shoot, sent over by an American creative team led by Amanda Lauran. Elopements are so en vogue right now, and I love how this one has a bright and beautiful colour palette that contrasts beautifully with the pale neutrals of the Vegas desert that provides the backdrop – so fun! I also love the intimacy of the day, as the bride and groom help one another get ready, before exchanging vows, sharing a small high tea style reception with vintage crockery and a gorgeous naked cake, and then riding off into the sunset on a motorbike. 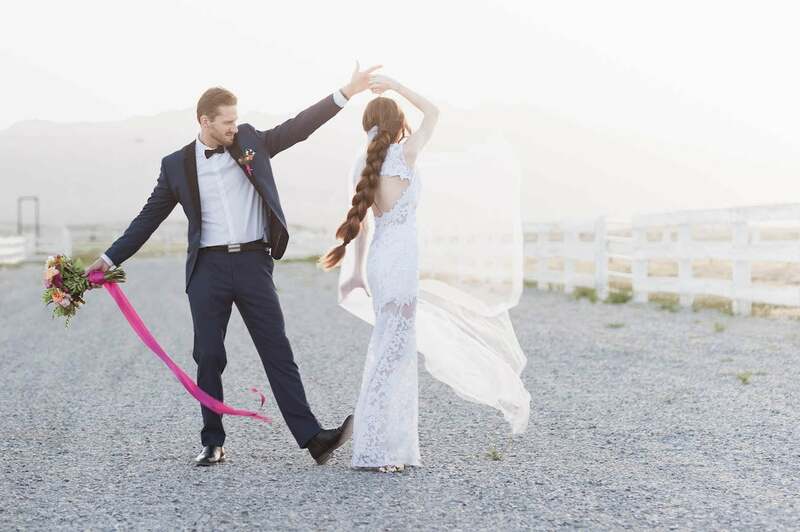 Eloping in Vegas never looked so adorable! Happy new week, friends! We’re kicking off this one with a BURST of colour, thanks to a fabulous team that includes photographers Shoots By Design and Katie Mayhew, and A Dream Come True Events. I actually got to know the lovely Simone of A Dream Come True a few months back, and I love that this is a lady who isn’t afraid of a bit of colour! Obviously bold isn’t for every bride, but when you really dive into a palette, it can truly pay off, and that’s exactly what these creatives did. They were inspired by those incredible pink sunsets (“There’s something about the pinkest sunset that that is simply put, breathtaking: it grows over the horizon and as the hue changes it becomes almost purple,” Simone told me) as well as this year’s Pantone fave, Ultra Violet, and using these colours as a starting point, pulled out all the stops to realise their creative vision. Nature even played along with the perfect pink sunset on the day! What I really love about this shoot is that while it’s a little avant garde, it’s still been created with an eye on practicality and budget friendliness. So let’s get inspired! GET READY. 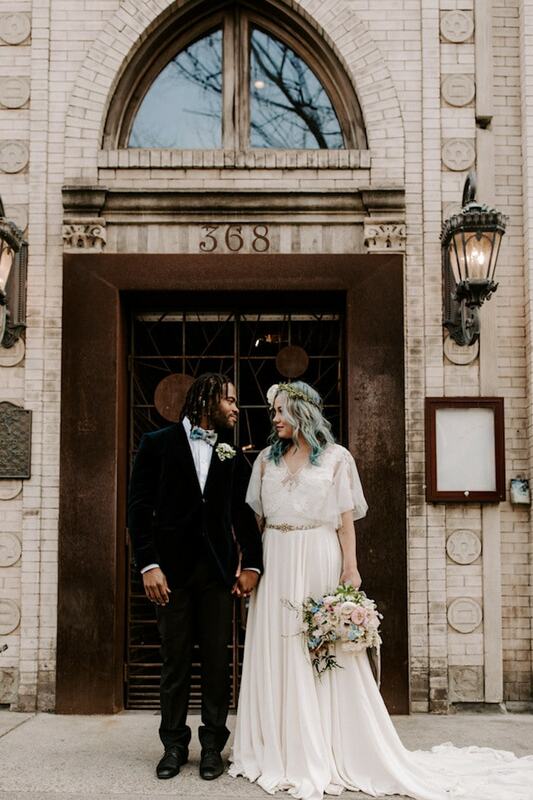 You’re about to have your socks blown off by today’s styled shoot, which takes the whole mermaid/iridescent/pearlescent wedding trend to the next level. Or rather I should say, the level below – way below. Under the sea to be precise. 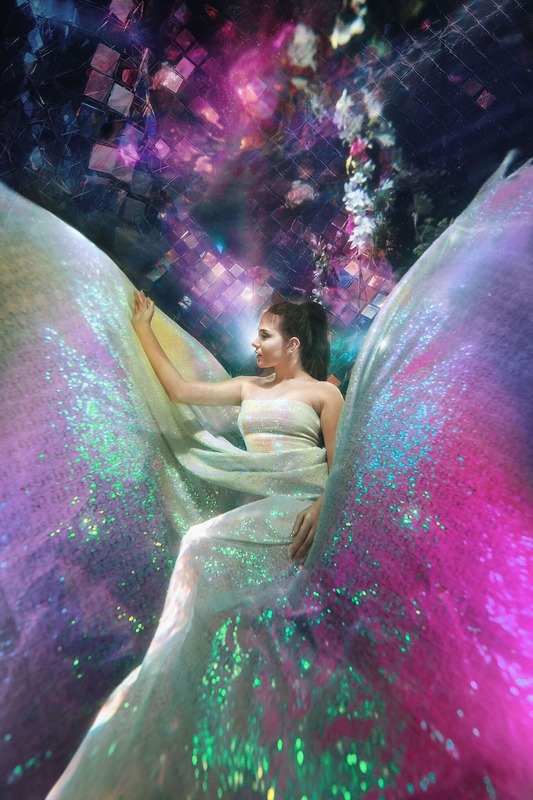 And I do mean literally, because the sterling team that put together this incredible shoot not only created a pastel wonderland on dry land, they shot an entire sequence underwater too. Insane. Well, as the song goes: darling it’s better down where it’s wetter, take it from me! From balloon backdrop to holographic flatware to geode cake to florals to… oh my gosh, I seriously am at a loss for words here. So let’s just, um, dive in, shall we? ;) Huge congrats to the talented pros who put this fabulously inspiring piece of work together, including SBB fave Tickled Pink, Ninirichi, Gingerale Photography, and underwater photography genius Ilse Moore. We’re shooting for the stars this morning, with a moody styled shoot inspired by this beautiful quote: “I have loved the stars too fondly to be fearful of the night”. 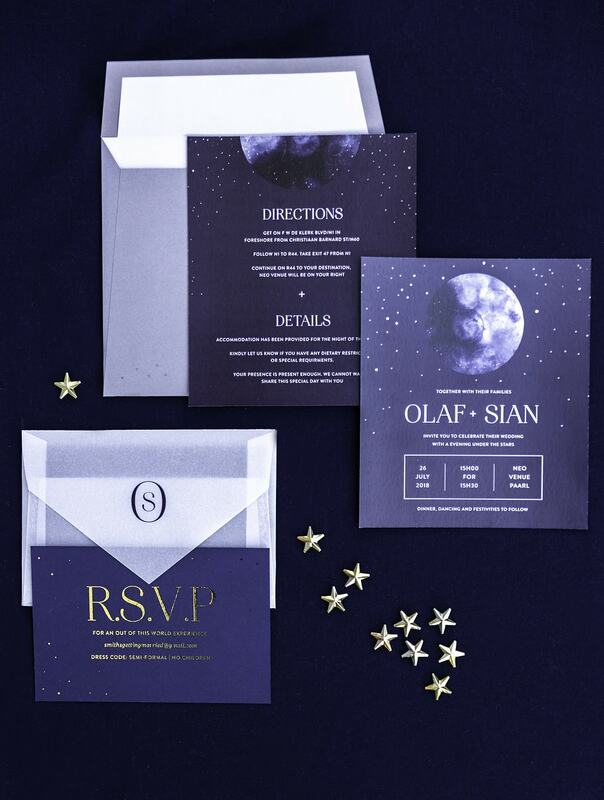 Celestial weddings are SUPER on trend right now, and I’m loving all the starstruck details here, from geometric elements on the table, to a gown with a constellation of bling, to the most beautiful celestial wedding invitation suite. And the cake is something else too! So let’s embrace the dark side of the moon and dive into these images by Candice Clarke Photography! 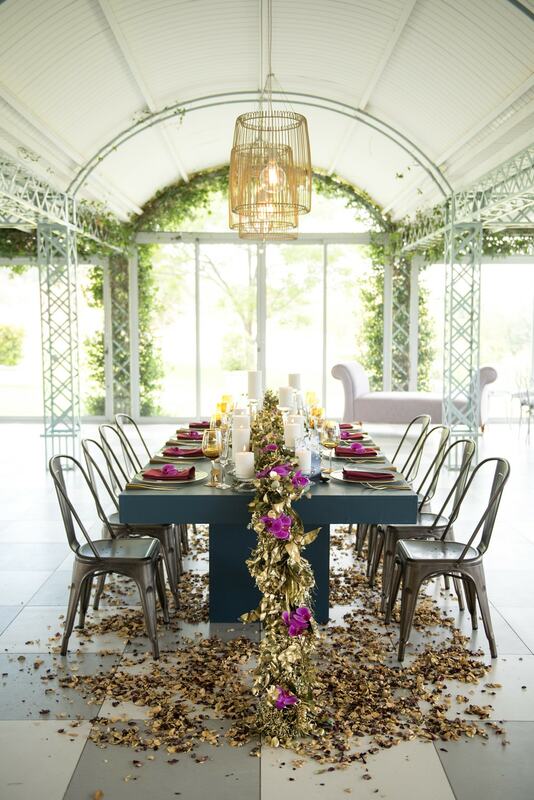 For more ideas on How to Style a Celestial Wedding, see our feature here. We’re going glam this afternoon! This opulent styled shoot from a team including photographer Jeanne Taylor, and stylist and designer Ronelda Rhode, is all about showcasing some stunning, modern gowns, set against tumbling orchids, a geometric ceremony backdrop, and gorgeously shiny golden foliage by the talented Nico from N Concepts and Design. It’s autumn wedding style, but with extra extra-ness. Think: orchid boa level extra. And as well as being lovely to look at and perfect for all you dark and moody tone brides, it’s also a great example of how with a bit of creativity, you can combine natural textures and modern elements for a fusion that’s surprising and visually delightful. And let’s be honest: FIERCE. Enjoy! OMG this engagement shoot though! 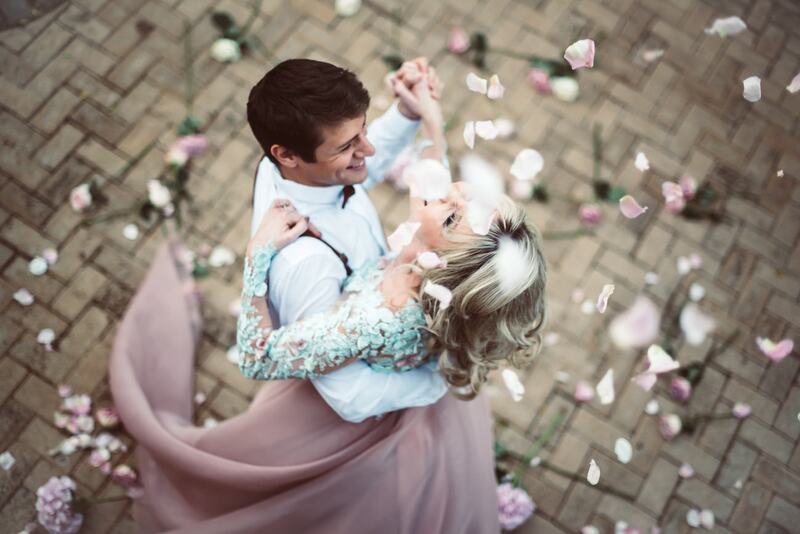 Literally, when I first came across Amber and Morne’s Cinderella-inspired couple session at Memoire on Instagram, I was totally convinced it was an editorial shoot with models instead of a real engagement, but that’s just because it’s so thoroughly romantic and beautiful (and the couple are so gorgeous!). A breezy spring vibe, a spectacular Elli-Nicole gown embellished with flowers that play perfectly against the blossoms and blooms that surround the couple throughout, a gorgeous vintage car… and of course the most breathtaking images from In Abundance Photography. It really is pure romance, so just take a deep breath and dive on in! The minute I saw today’s shoot, I knew it was spot on for the SouthBound Bride reader! This season y’all have embraced those deep, dark, rich and moody tones: berry reds, black, emerald, rich purple, etc. And while these colours naturally lend themselves to a winter wedding, there’s no reason why you can’t make them work just beautifully for summer too! 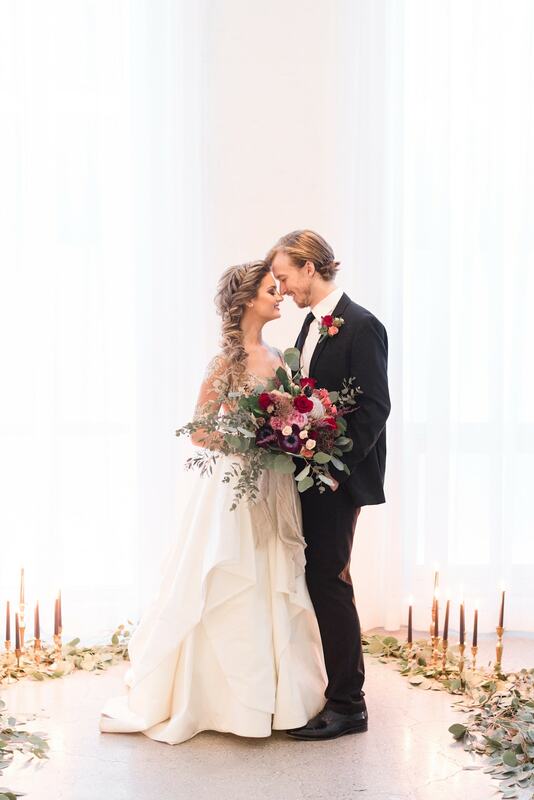 This styled wedding from Tori Lynn Photography and her team of talented Chicago wedding pros has a romantic, moody vibe and mixes deep autumnal colours with a light feel, making it perfect for any season. No surprises that my favourite element (besides a spectacular lace dress, velum stationery, and a beautiful black cake) is the bride’s protea bouquet – it’s a stunner! 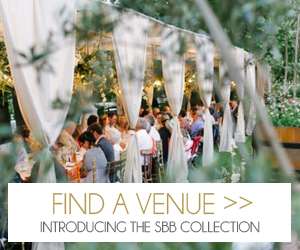 We’re closing out our week with some seriously amazing, truly South African bridal inspiration, set amongst the Overberg fynbos. 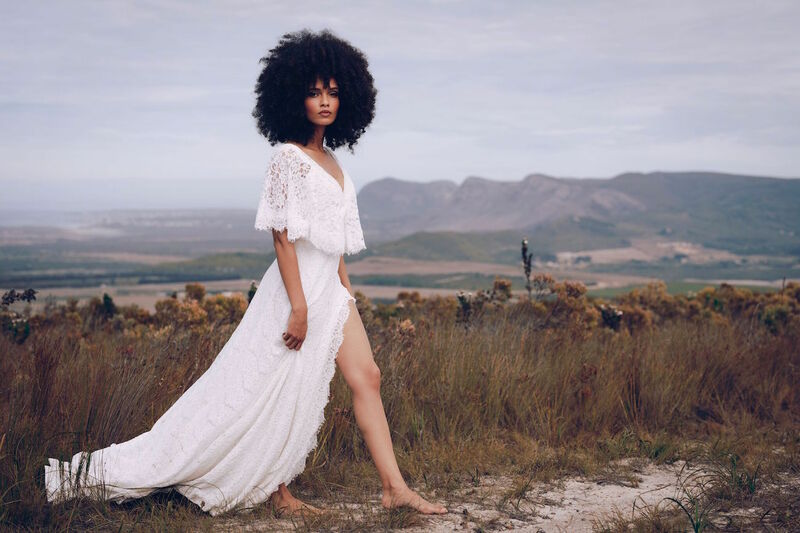 Not only are the gowns just perfect for a free-spirited boho bride and the models all absolutely stunning, but the images and styling are so on point – I have to tell you guys, I’m a little obsessed with these pics. They make me want to jump in a Landie and head for the hills, to soak up some of the wild beauty that is our beloved corner of the planet. 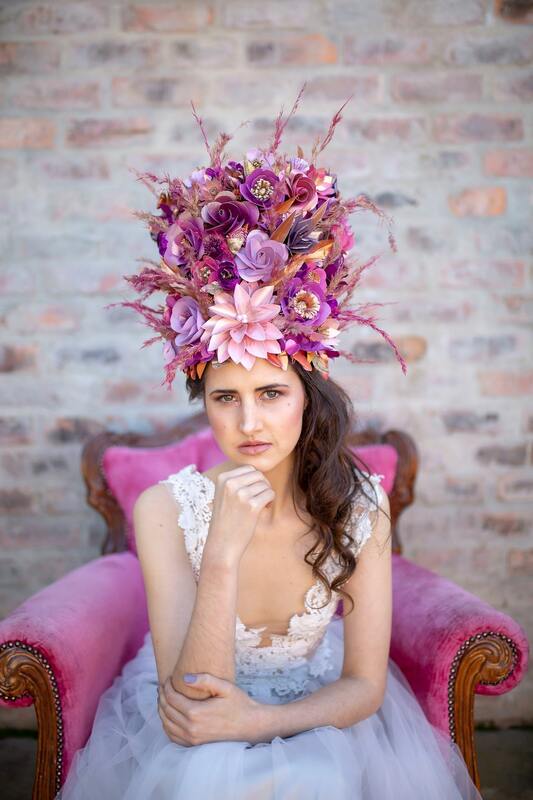 Gorgeous work by the team, which included photographers Nina Zimolong and Zach Louw, and MUAH artist Taryn Vogl! Fierce fashion, armfuls of beautiful blooms… and cake! I mean, really. What more does a girl need? Today’s gorgeous inspiration shoot comes from a talented Canadian team (led by Kathy Demerchant Photography and Sue Gallo Designs), and brings these elements together in the most stylish of settings – a fashion house in Hamilton, Ontario. With incredible, lush pastel florals and a jawdropping dessert spread (including the prettiest donuts ever! ), it’s all a bit Versailles, but in a very modern way, thanks to the clean lines of the contemporary wedding gowns and bold hair and makeup. I imagine this is what Marie Antoinette might have rocked if she’d been a bride today, right down to the sequin jacket. Let’s dive in, shall we?